Rivenspire is a region which forms the northern tip of High Rock. It is a gloomy place with jagged rock formations punctuating the rather bleak lowlands. The towering, flinty crags, windswept moors, and narrow canyons strike many folk as oppressive, even threatening. The King's Guard mountain range separates Rivenspire from the Glenumbra and Stormhaven regions to the south. 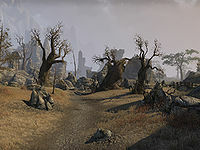 Being far from the Iliac Bay, Rivenspire has a reputation as the backwater of High Rock. The majority of creatures found in Rivenspire are of the aggressive type, including wolves and wraiths. Local hunters also make a living off the abundant giant bats and spiders. Eyebright Feld forms the southwest area, Westmark Moor forms the southeast, and the foggy northern coast is known as Boralis. The city of Northpoint is found in eastern Boralis. The city of Shornhelm dominates northeastern Eyebright Feld, near the center of Rivenspire. Westmark Moor has no major cities, but there are several settlements, and it is well-known for its burial grounds, including the legendary Crypt of Hearts. Rivenspire is plagued by a type of vampire called bloodfiends. Rivenspire has been home to many. Though it is predominantly inhabited in modern times by Bretons, the lost Redguard tribe known as the Horsemen can be found near the coast west of Shornhelm. There have been other migrants in days past. Ayleid ruins still dot the landscape, including the mighty tower known as the Doomcrag. Also, there is evidence in the wilderness outside Northpoint that giants once attempted to migrate to the region. However, they are no longer around; legends in the region speak of the "trammeling" of the giants long ago. Northpoint itself wouldn't be established until the 1E 800s, when a Breton trader formed the settlement as a stop along the Daggerfall-Solitude shipping route. House Tamrith has holdings primarily in the western half of Rivenspire, and it was their thriving trade with lands to the south that led to strong ties with Stormhaven and Wayrest. The rivalries between Tamrith and the houses of Dorell and Montclair date back to the late First Era, and each helped the region prosper in their own way. House Dorell are the descendants of the founder of Northpoint, and have held a barony since the days of Empress Hestra circa 1E 1029 (they even ruled Shornhelm for several generations in the First Era). For all their differences, the noble houses of Rivenspire hold many of the same traditions. Each house keeps its own fighting force, though in times of war or other emergencies, it is not uncommon for house troops to join with the city guard to form a single fighting force in defense of the region. The nobility of Rivenspire are known for burying their dead beneath the gnarled trees of Westmark Moor (except for monarchs, who are all buried in the great cemetery of Cath Bedraud in Glenumbra). In Ranser's War circa 2E 566, King Ranser of Shornhelm led reticent nobles in the region to war against Wayrest, cleaning out his coffers in an ultimately fruitless campaign. In the end, the retaliation against King Ranser despoiled Rivenspire, and it was still recovering over fifteen years later. When Ranser was defeated, High King Emeric allowed a triumvirate of the three prominent houses to rule over Rivenspire until he found a suitable replacement to become the new King of Shornhelm. Shornhelm would remain kingless for years as a result. Baron Wylon of Montclair asserted his claim to the throne, being the grandson and sole remaining heir of King Hurlburt (the king before Ranser), but many seemed reticent to trust the Montclairs. A relatively small noble house, Ravenwatch, remained neutral throughout Ranser's War. Though the house claims to prefer the shadows, Count Verandis Ravenwatch made a rare public announcement circa 2E 582 in which he called for the destruction of the Lightless Remnant, an ancient artifact in Rivenspire which had been studied unsuccessfully for generations. Lord Verandis believed the Remnant was possessed of a corrupting power which was souring other Rivenspire nobility, and he made its eradication the first priority of his house. The nobles of Rivenspire objected without success to the inclusion of Orcs in the Daggerfall Covenant. Rumor has it that a pool or spring somewhere in the highest peaks of Rivenspire may grant immortality. Esta página foi modificada pela última vez à(s) 21h35min de 8 de agosto de 2014.